Two weeks ago this same man had told me the uprisings in Tunisia and Egypt would never touch Libya. Gaddafi, he said, had a tight lock on all of the major tribes, the same ones that have kept him in power for the past 41 years. The man of course turned out to be wrong, and everything he now has to say about Gaddafi's intentions needs to be taken in that context. My Libyan source said that Gaddafi has told people around him that he knows he cannot retake Libya with the forces he has. But what he can do is make the rebellious tribes and army officers regret their disloyalty, turning Libya into another Somalia. 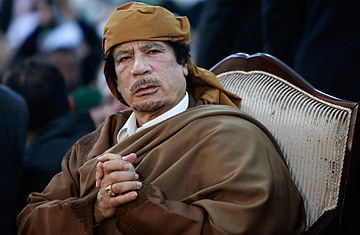 "I have the money and arms to fight for a long time," Gaddafi reportedly said. As part of the same plan to turn the tables, Gaddafi ordered the release from prison of the country's Islamic militant prisoners, hoping they will act on their own to sow chaos across Libya. Gaddafi envisages them attacking foreigners and rebellious tribes. Couple that with a shortage of food supplies, and any chance for the rebels to replace Gaddafi will be remote.